As early as 1843 a line watermarked paper grade was introduced at Stowford Paper Mills. Two examples of this particular watermarked paper exist in our archive files. A letter written on azure laid paper bearing this watermark was unearthed in the late 1990s in Hong Kong. The second example was a letter written in 1848, sent from Brooklyn, New York, to an address in Plymouth. A ream at this time consisted of 20 quires, with each quire containing 24 sheets, hence a total of 480 sheets. However, reams of 500 sheets and 516 sheets were also common. It was normal for paper to be packed at the mill with top and bottom quires made up of slightly damaged sheets, known as ‘outsides’ to protect the good quires (insides). The outside quires were often referred to as “cassie quires” (derived from the French casseé, meaning broken). A ream at this time consisted of 20 quires, with each quire containing of 24 sheets, hence a total of 480 sheets. However, reams of 500 sheets and 516 sheets were also common. It was normal for paper to be packed at the mill with top and bottom quires made up of slightly damaged sheets, known as ‘outsides’ to protect the good quires (insides). The outside quires were often referred to as “cassie quires” (derived from the French casseé, meaning broken). Azure Laid is a bluey-green tinted paper incorporating a laid watermark, characterised by a series of vertical lines which are then crossed by a series of closely spaced horizontal ones, to give the appearance of hand made paper. Qualities varied from cheap ‘all-wood’ grades to esparto grass, part rag to ‘all-rag’ machine made grades. All higher class papers were tub-sized, or tub-sized and engine sized, largely used for account books, but also documents such as Wills and Agreement forms. 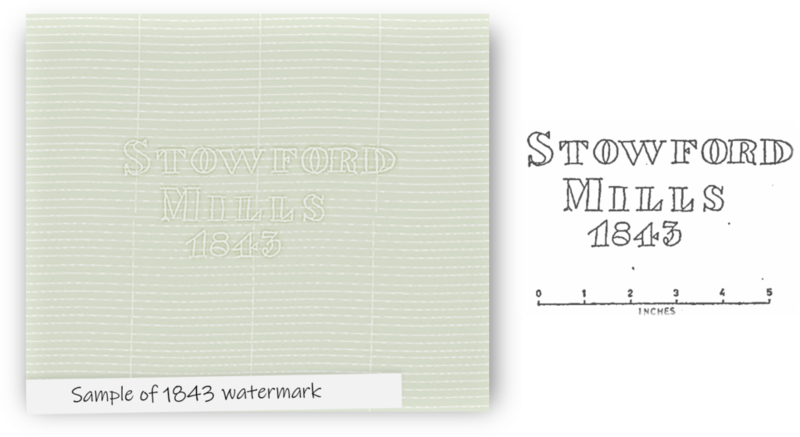 British manufactured papers at this time often displayed combinations of the mill number (Stowford was mill number 191), company name, mill name and initials or monogram of the owner or master papermaker. These were initially encouraged by an Act of Parliament, since by including a watermark to identify the paper and record its date of manufacture, the paper mill was able to reclaim excise duty. From the mid-nineteenth century, watermarks became the norm in Britain, with the majority of paper produced incorporating such devices. One only has to study the production books of Stowford Paper Mill from the turn of the century, to note the plethora of different watermarked banks, bonds, parchments and loan papers. Stowford Mill, was documented as being a producer of Fine and Superfine, Vellum and Banks, Book, Envelopes and Cartridge Papers, Blottings, Tub-sized Air-Dried Paper of every grade and character, with an output of 2,000 tonnes per annum. Excerpts taken from the report of his death on 17th October 1877. John Allen and later his two sons Edward and John, ran and developed the paper mill over a period of sixty years. It is doubtful that without their money, enterprise and foresight, the mill would have survived the second half of the nineteenth century, a period when so many small mills disappeared. Soon after purchasing the mill Allen set about the task of rebuilding and expanding the site. He installed two new paper machines, built a new rag loft, (inscribed Stowford Paper Mills A.D. 1862), and bought new rag boilers, breakers and beaters. James Thomson, a London paper merchant based in Fleet Street was a stockist of paper from John Allen & Sons at the turn of the twentieth century, describing the range of products as “Celebrated English Made Tub-Sized Writing Papers”. This was a period when English made products of all kinds were definitely in vogue. Several different watermarks were offered. John Allen Superfine, available in Cream Wove and Laid, Blue Wove, Mill Finish or Plate Glazed, all in a variety of weights. An alternative, John Allen Fine, was available in Cream Wove and Laid, Mill Finish or Plate Glazed again in a variety of weights. Other grades from James Thomson’s catalogue were : Old Plymouth 191 Bond, available in Cream Loan Bond – Mill Finish; Ivy-Glen Linen, available in Cream and Azure Wove – Tub-sized Bank and Bond; Ermevale Superfine, available in Cream Wove and Laid – Plate Glazed. The stockist’s sales catalogue indicated sales prices of 6d to 7d per lb of paper, but with a discount of ½d if purchased in 3 cwt lots! Make sure that the paper you are using is of Devonshire manufacture. These are only a few of the famous papers made at the Stowford Mill. You cannot mistake them. The name is watermarked in each sheet, and the name is a guarantee of quality. These paper are made in various shades and substances. They can be had rough or smooth or with a beautiful cambric finish as delicate in appearance as it is delightful to write on. For private use they are unexcelled. For commercial purposes they are not only economical but they convey a good impression of the standing of a firm. Air-drying is performed by passing the sized web of paper over open skeleton drums (spar drums) or cylinders, where the circulation of moist air evens up the moisture content of the paper to equality with the humidity of the atmosphere, thus preventing waviness through unequal absorption of water vapour from the air. The treated paper is then calendared by passing the web through, quite often a stack of smooth steel cylinders to ‘iron out’ the surface of the paper and give the desired degree of gloss. Loft-drying was the costliest method, but produced the finest result, ensuring perfectly natural sizing and drying. Only sheets of paper (not reels) can be sized and dried by this method. In the paper trade, particularly amongst Paper Merchants, banks and bonds were historically termed as the ‘bread and butter’ grades, since they provided solutions for all everyday personal and commercial requirements, ranging from business forms, personal writing stationery, typing and copying papers. Banks were light weight paper grades, Large Post (16½” x 20¾”) 10lbs – 13lbs, a grammage range of 40-55 gsm when expressed in today’s metric measurement of paper substance. However, there were Manifold Banks (equivalent of tissue papers today) and Airmail Banks of Large Post 7 lbs (30 gsm) and lower. Airmail paper needed to be lightweight to enable economical air shipment and highly opaque to prevent show through (reading from the reverse or through the airmail envelope) due to its low thickness. Bond papers are heavier paper grades, Large Post 15lbs – 18lbs (60-75 gsm) characterised by high permanence and durability, high surface strength to withstand writing and erasing, and high stiffness. Unwatermarked bond papers, made from woodpulp, were used for invoices and other business forms, whilst higher quality cotton content bond papers (ranging from 25-100% cotton) provided for distinctive letterheads and writing papers, as well as matching envelopes. A strong durable medium to heavy writing paper with good erasing quality used in business ledgers and record books. Ruling properties either by pen or lithography (printing process) and sheet strength were important aspects of this grade. These were generally manufactured as azure laids or woves, but could also be produced in white and buff. The term loan indicates a paper similar to bond but of very high grade, but often somewhat heavier and stronger. Often, due to these properties, the paper experienced a ‘very wild appearance in the look through’ to quote a Wiggins Teape training manual of 1956! Whilst Bonds could be of high or low quality, loans were usually of highest quality and generally of a guaranteed rag (cotton) content and gelatine sized for robustness. Typical uses were legal documents, agreements and bank and other company documents. Once dried, paper was rough surfaced, so a method of producing a smooth surface on sheets of generally handmade paper was required. This was achieved by placing individual sheets between polished plates of zinc or copper to produce a pile of thirty or forty sheets. The stack was then fed between heavily loaded metal rollers, the angle of exit being different from the angle of entry, which caused slight slippage. The combined effect of the slipping and pressure served to polish the surface of the paper. Originally a cream opaque grade of excellent quality with a strong historical association with ancient times when scrolls were written on dried animal skins. Made by hand of finest materials. The surface often coated in dilute sulphuric acid to give the paper its ‘peculiar appearance’. A variation of parchment, Superfine was a modern name for a very high grade paper usually associated with a fine close look through and very smooth finish. A number of paper terms existed in the early twentieth century relating to paper quality. T.S (sometimes A.T.S. ), or E.S. were terms which indicated that the paper was tub-sized, animal tub-sized, or engine sized, the two former being synonymous. Sizing then as indeed it does today, enables paper to take writing ink without feathering or penetration. Engine-sizing was performed in a beater, an early stage in the paper making process, by introducing a resin emulsion into the pulp. Tub-sizing was performed upon the finished paper by passing it through a vat containing a hot solution of gelatine, then through squeeze rolls and finally reeled wet so that the gelatine could permeate into the paper. Gelatine was used for decades as a sizing material and was obtained from skin and bones. Due to its relatively high cost it was often only used on the highest grades of paper. There was a distinction between the two forms of sizing. British manufactured papers at this time often displayed combinations of the mill number, company name, mill name and initials or monogram of the owner or master papermaker. These were initially encouraged by an Act of Parliament and by including a watermark, to identify the paper and record its date of manufacture, the paper mill was able to reclaim excise duty. From the mid-nineteenth century, watermarks became the norm in Britain, with the majority of paper produced incorporating such devices. One only has to study the production books of Stowford Paper Mill from the turn of the century, to note the plethora of different watermarked banks, bonds, parchments and loan papers. Stowford Mill, No. 191, was documented as being a producer of Fine and Superfine, Vellum and Banks, Book, Envelopes and Cartridge Papers, Blottings, Tub-sized Air-Dried Paper of every grade and character, with an output of 2,000 tonnes per annum. Soon after purchasing the mill he set about the task of rebuilding and expanding the site. He installed two new paper machines, built a new rag loft, inscribed Stowford Paper Mills A.D. 1862, and bought new rag boilers, breakers and beaters. James Thomson, a London paper merchant based in Fleet Street was a stockist of paper from John Allen & Sons, Ivybridge at the turn of the Century. In their catalogue of 1911 it describes the range of products as “Celebrated English Made Tub-Sized Writing Papers”. This was a period when English made products of all kinds were definitely in vogue. John Allen Superfine was available in Cream Wove and Laid, also Blue Wove, Mill Finish or Plate Glazed, in a variety of weights. John Allen Fine was available in Cream Wove and Laid, Mill Finish or Plate Glazed in a variety of weights.